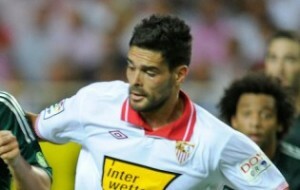 Reports are out claiming that Sevilla centre-back Alberto Botia is back on the Premier League radar. The Daily Mail claims that Tottenham are showing interest in Botia. The 24-year-old former Barcelona trainee is on the wishlist at Swansea and Wigan also but Tottenham are considering a deal with concerns over Steven Caulker’s future and William Gallas set to leave.